1 ELECTRICITYt Electromagnetism Subject area : Physics Topic focus : magnetic properties, magnetic field, the Earth s magnetic field, magnetic field of an electric wire. Learning Aims : Polarity of bar magnets ( they have two poles : like poles repel, opposite poles attract each other. Magnetic field (How to detect a magnetic field - experiments ) The origin of the Earth s magnetic field. What electromagnetism is. The origin of the electromagnetism Oersted s experiment (Laboratory report). Skills : Reading : decoding information; scanning for specific information, interpreting visuals. Speaking: defining and describing. Listening : listening to CD-ROM. Writing : fill a schedule. Method :solve problems, interpret phenomena, ask questions, tests. Role play. Assessment: CLIL assessment, assessment grid for an oral presentation, assessment rubric to evaluate communicative skills, assessment rubric for experimental studies. 1-Magnetic properties These activities are meant to make students aware of the concrete application of abstract concepts. Have students try out little experiments on magnetism.the assignment should be given the day before the lesson. 1. Use two bar magnets and do a few little experiments so you can answer the following questions. 1.Do the magnets attract all objects? a. List 10 objects that are affected by the magnets. Do they have anything in common? 5 to rise. That s called convection, which generates an electric current and, as result, a magnetic field. The Earth s magnetic field is similar to that of a bar magnet. The north pole of a compass needle is a magnetic north pole. It is attracted to the geographic North Pole, which is a magnetic south pole (opposite magnetic poles attract). 7 The energy density of the magnetic field depends on the strength of the field, squared, and also upon the magnetic permeability of the material it fills. Iron has a much, much larger permeability than a vacuum. Even small solenoids can exert forces of a few newtons. The intensity of the magnetic field generated by a solenoid is determinate by the amount of current flowing through the wire, the number of coils and the distance from the wire. The unit of intensity of a magnetic field is called the tesla (T). Another unit used is the gauss, where 10 4 (10,000) gauss equals 1 tesla. An example of a very intense magnetic field is that generated by a magnetic resonance imaging (MRI). We can also say that when a magnetic field is generated by a straight wire, the magnetic intensity decreases with distance, that is, it is inversely proportional to the distance. For example, the magnetic force at 2 cm from a wire is half than at 1 cm, and the force at 3 cm is one third the force at 1 cm. 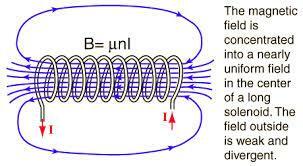 Magnetic Field Due to a Solenoid A solenoid is a long coil (shaped like a cylinder) containing a large number of close turns of insulated copper wire. 8 The figure above shows a solenoid SN whose ends are connected to a battery B through a switch X. When a current is passed through a solenoid, it produces a magnetic field around it. The magnetic field is shown in the fig. It is along the axis of the solenoid and is almost constant in magnitude and direction. The magnetic lines of force inside the solenoid are nearly parallel to each other and parallel to the axis of the solenoid. A solenoid when suspended freely, aligns itself in the north-south direction, thus behaving like a bar magnet. One end of the solenoid acts like a north pole and the other end the south pole. 9 The polarity of the solenoid can be changed by reversing the direction of the current. 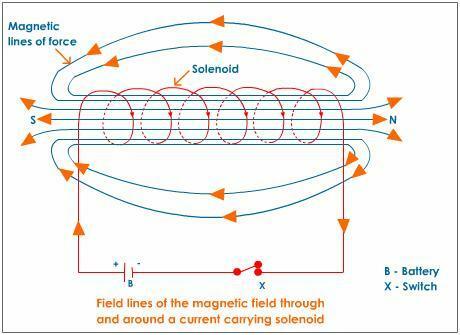 The strength of the magnetic field produced by a current carrying solenoid depends on: The number of turns - larger the number of turns, greater is the magnetism produced. The strength of the current - when current increases, magnetism also increases. Nature of 'core-material' used in making the solenoid - if we use soft-iron as a core for the solenoid, then it produces the strongest magnetism. 12 field strength higher than without the core. When electricity passes through the coils of wire, a magnetic field develops around it, which is caught in the ferromagnetic core. The magnetic field goes through the core, out one end of the core and back in the other end. 2-Which devices use electromagnets? Electromagnets are used everywhere. Electric motors, speakers, and power door locks are some devices that use electromagnets. 3-How do you make an electromagnet? It is fairly easy to build an electromagnet. All you need to do is wrap some insulated copper wire around an iron core. If you attach a battery to the wire, an electric current will begin to flow and the iron core will become magnetized. When the battery is disconnected, the iron core will lose its magnetism. Follow these steps if you would like to build the electromagnet. 13 A Simple electromagnet Can you make a magnet from a nail, some batteries and some wire? If you wrap your wire around a nail 10 times, connect the wire to a battery and bring one end of the nail near the compass, you will find that it has a much greater effect on the compass. In fact, the nail behaves just like a bar magnet. What you have created is an electromagnet! You will find that this magnet is able to pick up small steel things like paper clips, staples and thumb tacks. 14 Answer the following True or False questions about magnets and electromagnets: T/F 1. Heating or hitting a permanent magnet can ruin it. 2. Iron is a good metal to use to make an electromagnet. 3. The north pole of one magnet will attract the north pole of another magnet. 4. Magnets and electromagnets are used in many devices. 15 I think that increasing the voltage will...the electromagnet s strength. (increase, decrease or not change) I think that increasing the wire coils will the electromagnet s strength. Questions to think about: (increase, decrease or not change) 1. What happens to the strength of the electromagnet when more turns of wire are used? 2. What happens to the strength of the electromagnet when more volts are used? 3. Where can you find electromagnets in your home? 4. How can you make a permanent magnet lose its magnetism? 5. How can you measure the intensity of a magnetic field generated by a solenoid? 16 Writing about magnetism [Think about what you know about magnets] Let s apply the formula! A coil with 10 loops produces a magnetic field with an intensity of 2 gauss. 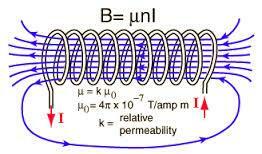 Calculate the intensity of a magnetic field produced by a coil with 20 loops. The Power of Magnets Grade 6 Activity Plan 6.5 The Power of Magnets Objectives: 1. To learn about magnetic fields 2. To learn about some of the different applications for magnets and electromagnets. 3. Unit 4 Magnetism. The first compass. The Earth Is a Magnet Magnetism is one of the most important natural phenomena. Magnetic force was known over 2000 years ago by the Greeks. The first magnetic stones were found in Magnesia near Asia Minor. VO Magnets are all around us, from the simplest child s toy to the most powerful electromagnet. How do magnets really work? Each Magnet has a north and a south pole. The field lines are always from N to S outside the magnet & S to N inside the magnet. 1 What You Will Learn Describe the properties of magnets. Explain why some materials are magnetic and some are not. Describe four kinds of magnets. Give two examples of the effect of Earth s magnetic field. Chapter 16 Magnetism. How can a magnet be strong enough to lift a car? What is the biggest magnet on Earth? How does a compass work? 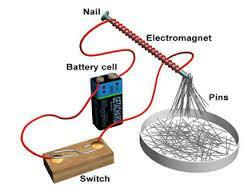 Energy, electricity and magnetism page The diagram below shows an object made from a battery, a nail, and some wire. The Charge to Mass Ratio (e/m) Ratio of the Electron. NOTE: You will make several sketches of magnetic fields during the lab. LEVITATING TRAIN. DESIGN CHALLENGE Build a magnetic levitating train that can balance on a magnetic track without falling.